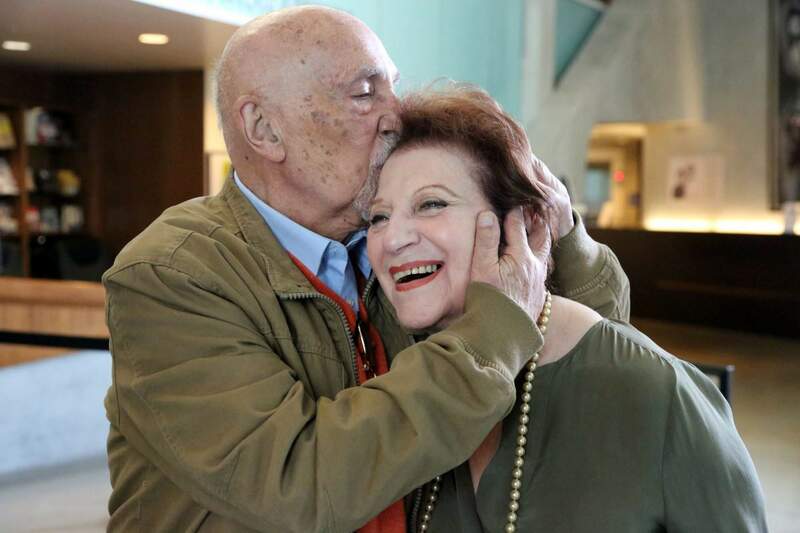 Childhood Holocaust survivors Simon Gronowski and Alice Gerstel Weit embrace at the Los Angeles Holocaust Museum. When the Nazis arrived, Gronowski’s father was in a hospital. His wife quickly lied, telling them he was dead and sparing him from Auschwitz. It was on a train to that death camp a few weeks later that she saved her son, pushing him toward the door of the boxcar they were in and telling him to jump. 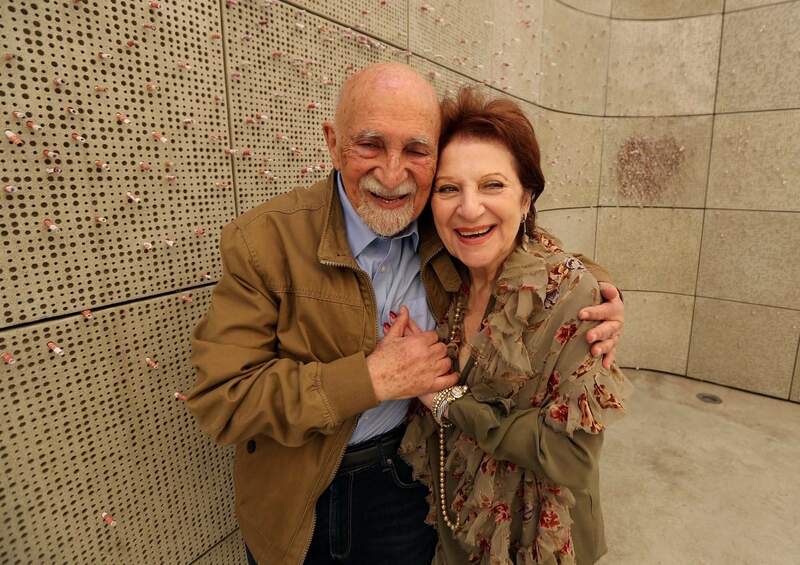 Childhood Holocaust survivors Simon Gronowski and Alice Gerstel Weit stand at the Los Angeles Holocaust Museum memorial. After the Nazis invaded Belgium, they hid together in the Gronowski family’s home before the Gerstel family fled on a perilous journey that eventually led them to the United States. Gronowski’s family stayed behind, and his mother and sister died at Auschwitz. For 76 years Gerstel Weit didn’t know Gronowski was the family’s only survivor. The two returned to the museum recently to recount to visitors how the Holocaust ripped apart a pair of families that had become fast friends after a chance meeting at a Belgian beach resort in 1939. 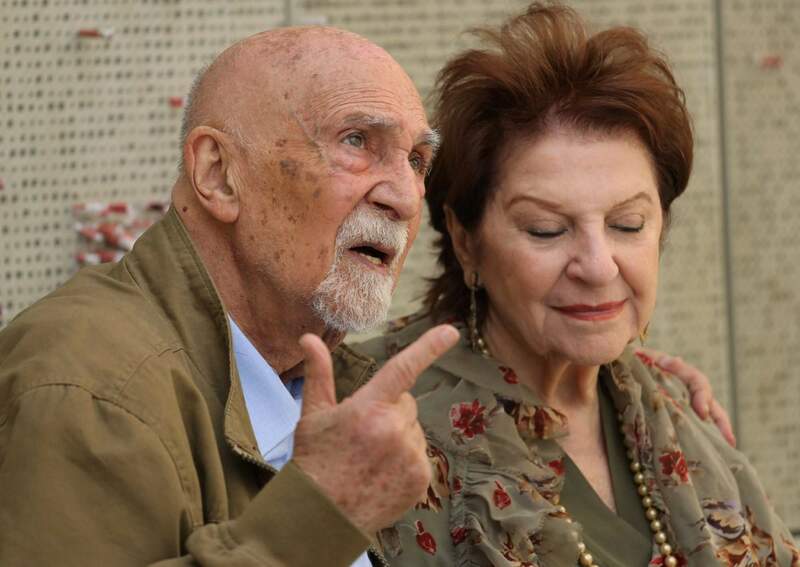 Childhood Holocaust survivors Simon Gronowski and Alice Gerstel Weit are interviewed at the Los Angeles Holocaust Museum memorial. After the Nazis invaded Belgium they hidin the Gronowski family’s home before the Gerstel family fled on a perilous journey that eventually led them to the United States. Gronowski’s family stayed behind, and his mother and sister died at Auschwitz. For 76 years Gerstel Weit didn’t know Gronowski was the family’s only survivor. 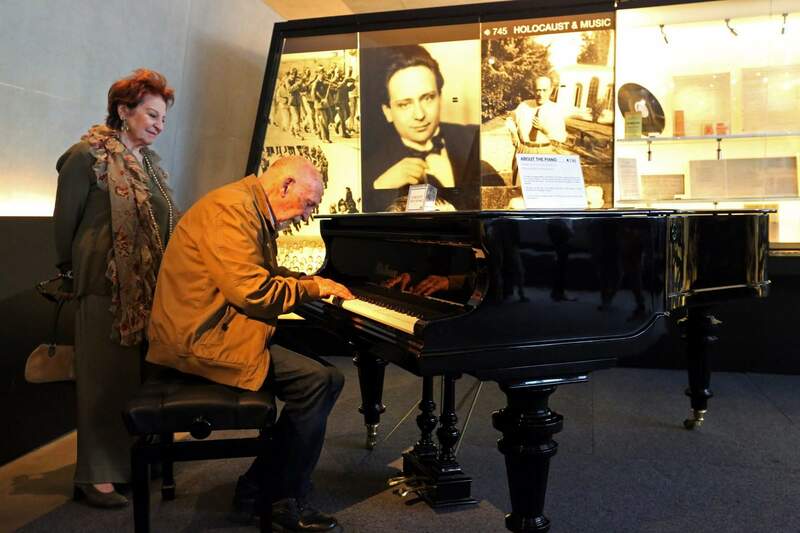 Childhood Holocaust survivor Simon Gronowski plays “What a Wonderful World” while he and Alice Gerstel Weit tour the Los Angeles Holocaust Museum after their reunion after more than 70 years. After the Nazis invaded Belgium they hid together in the Gronowski family’s home before the Gerstel family fled on a perilous journey that eventually led them to the United States. Gronowski’s family stayed behind and his mother and sister died at Auschwitz. For 76 years Gerstel Weit didn’t know Gronowski was the family’s only survivor. 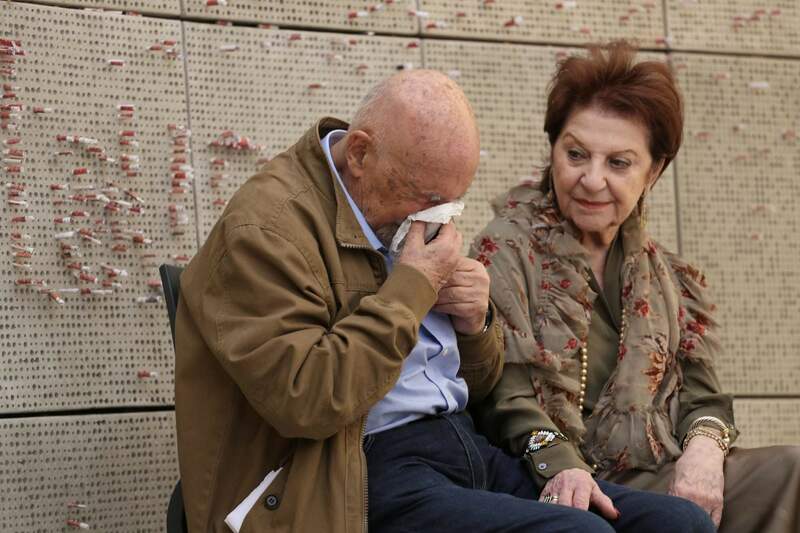 Childhood Holocaust survivors Simon Gronowski and Alice Gerstel Weit are interviewed at the Los Angeles Holocaust Museum memorial after their reunion after more than 70 years. There was much hugging, kissing and crying Wednesday as the two old friends held hands tightly while sitting outside on a museum patio to share memories from a long-ago past. 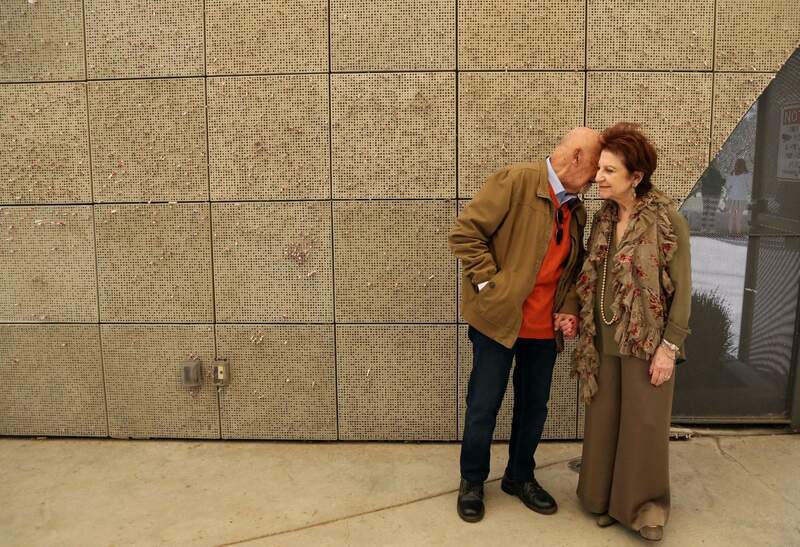 Childhood Holocaust survivors Simon Gronowski and Alice Gerstel Weit hug at the Los Angeles Holocaust Museum memorial. 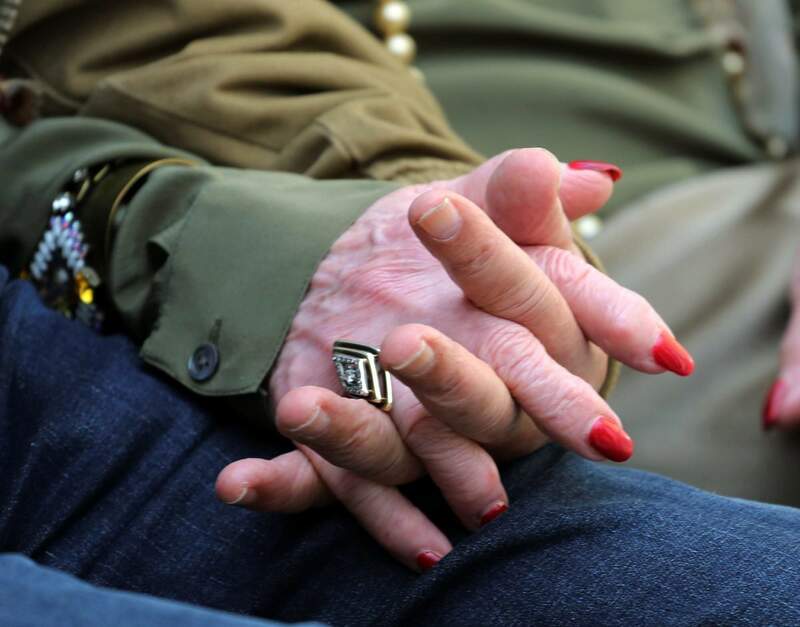 There was much hugging, kissing and crying Wednesday as the two old friends held hands tightly while sitting outside on a museum patio to share memories from a long-ago past. 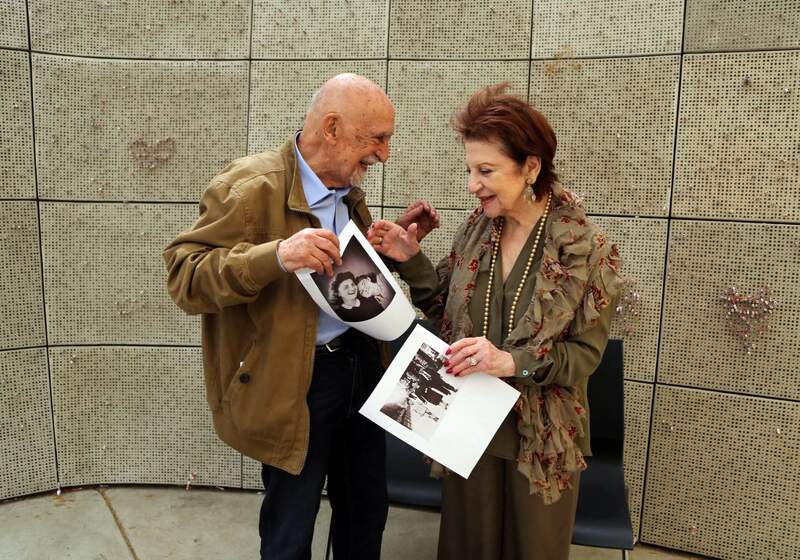 Childhood Holocaust survivors Simon Gronowski and Alice Gerstel Weit exchange photographs they haven’t seen in decades, at the Los Angeles Holocaust Museum memorial. After the Nazis invaded Belgium, they hid together in the Gronowski family’s home before the Gerstel family fled on a perilous journey that eventually led them to the United States. Gronowski’s family stayed behind, and his mother and sister died at Auschwitz. For 76 years Gerstel Weit didn’t know Gronowski was the family’s only survivor. She had an emotional reunion with him recently. 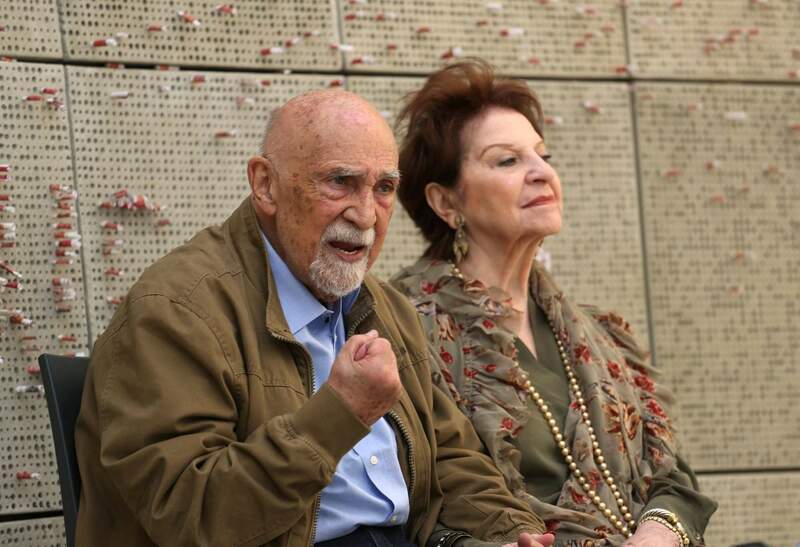 Childhood Holocaust survivors Simon Gronowski and Alice Gerstel Weit are interviewed at the Los Angeles Holocaust Museum memorial. After the Nazis invaded Belgium the two hid together in the Gronowski family’s home before the Gerstel family fled on a perilous journey that eventually led them to the United States. Gronowski’s family stayed behind, and his mother and sister died at Auschwitz. For 76 years Gerstel Weit didn’t know Gronowski was the family’s only survivor. LOS ANGELES – When Alice Gerstel bid an emotional farewell to her family’s closest friends in October 1941, she was hopeful she’d see “Little Simon” Gronowski again. And she did – 76 years later and half a world away from where they were separated in Brussels. 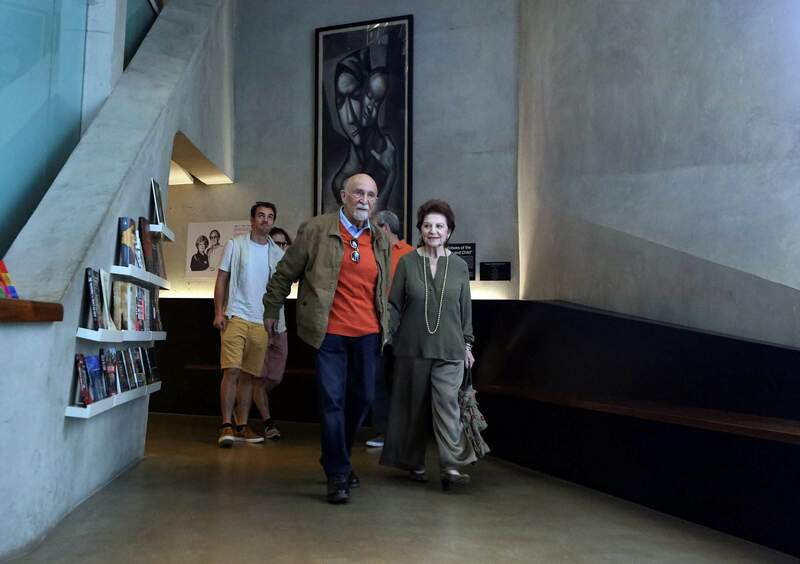 Childhood Holocaust survivors Simon Gronowski, center right, and Alice Gerstel Weit hold hands as they tour the Los Angeles Holocaust Museum. After the Nazis invaded Belgium, they hid together in the Gronowski family’s home before the Gerstel family fled on a perilous journey that eventually led them to the United States. Gronowski’s family stayed behind, and his mother and sister died at Auschwitz. For 76 years Gerstel Weit didn’t know Gronowski was the family’s only survivor. Her son Dann Netter is at left; his grandson Romain De Nys at right. 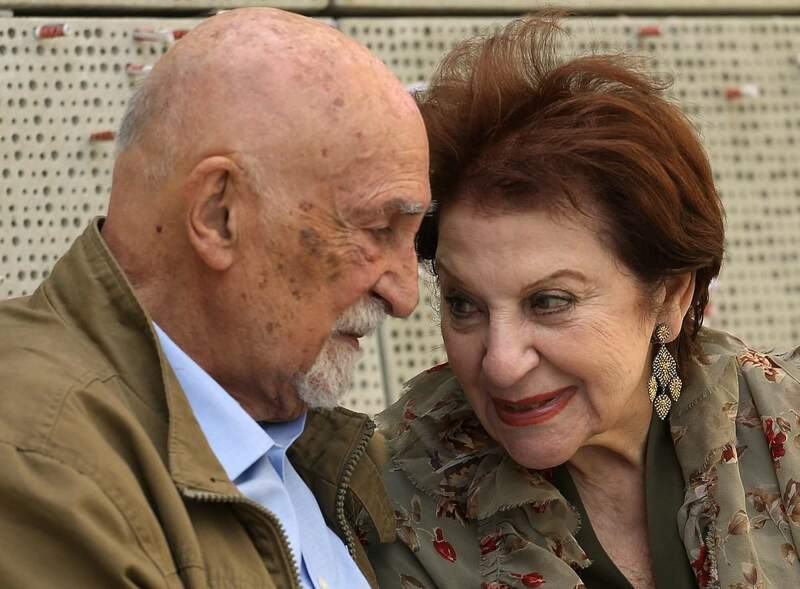 Childhood Holocaust survivors Simon Gronowski and Alice Gerstel Weit join their hands as they are interviewed at the Los Angeles Holocaust Museum memorial after their reunion after more than 70 years. After the Nazis invaded Belgium the two hid together in the Gronowski family’s home before the Gerstel family fled on a perilous journey that eventually led them to the United States. Gronowski’s family stayed behind and his mother and sister died at Auschwitz. For 76 years Gerstel Weit didn’t know Gronowski was the family’s only survivor. 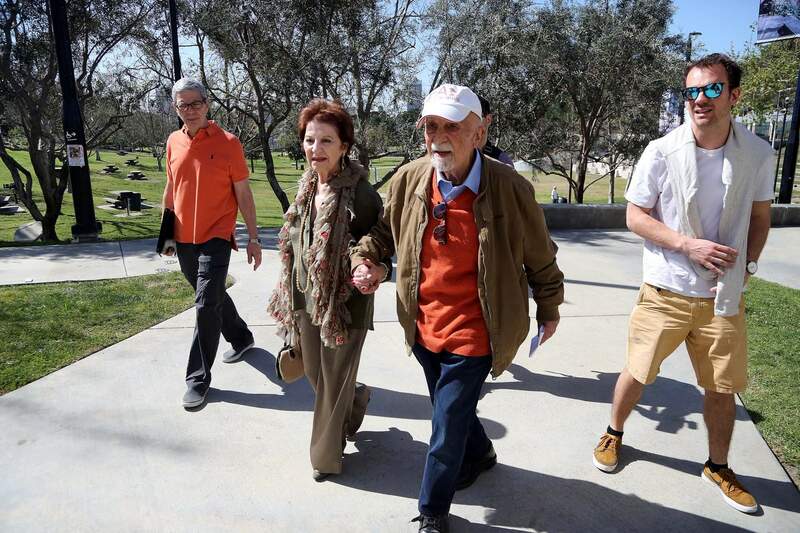 Childhood Holocaust survivors Simon Gronowski and Alice Gerstel Weit walk into the Los Angeles Holocaust Museum. In their childhood, Simon Gronowski, and Alice Gerstel Weit’s families vacationed together. After the Nazis invaded Belgium, they hid in the Gronowski family’s home before the Gerstel family fled on a perilous journey that eventually led them to the United States. Gronowski’s family stayed behind, and his mother and sister died at Auschwitz. For 76 years Gerstel Weit didn’t know Gronowski was the family’s only survivor. Immediately after the war, her family tried to locate their friends. Gronowski eventually wrote back to Gerstel Weit’s late older brother Zoltan, telling him his sister and mother had died at Auschwitz and his father had since passed away. For some reason, Zoltan never told his family “Little Simon” survived. “But when we received information of the concentration camps, the gas chamber, the mountains of corpses, my father understood that his wife and his daughter would not come back. And he died of ...,” he said, his voice trailing off.